Home / Products / Professional Cookware / PRIMO! Spring USA introduces their newest line of multi-use cookware, Primo! Cook & Serveware. 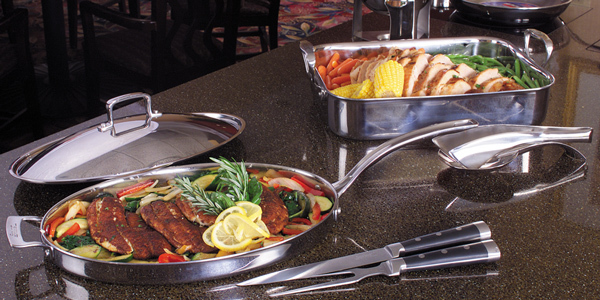 This newest offering is ideally suited for Buffet “Cook to Order” service. Pieces feature the Spring USA trademark 5-ply, bonded body with rolled & sealed rims for superior strength & durability. The aluminum core allows for fast, even heat distribution from pan bottom to upper rim. The products unique sealed rim ensures aluminum never comes in contact with your food. This new line of cookware is suited for all heat sources; gas, electric, ceramic & induction. With its elegant design, and rugged durability, this new line of professional cookware makes it perfect for banquet service or display applications. The newest edition to the Primo! line of cookware. This mini roaster is made up of our 5-ply, bonded, stainless steel. Our rims are rolled and sealed for long service life. Impressive mirror-polished finish. For cooking or displaying. 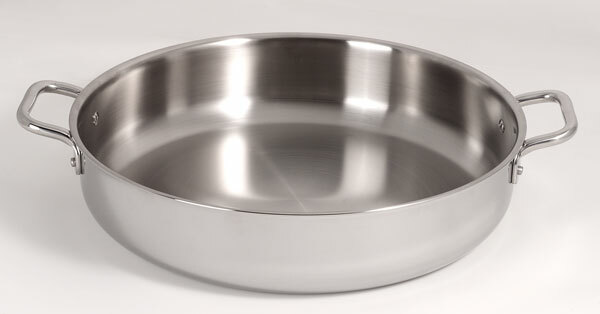 Inside dimensions for this pan are 12″ x 8-1/4″. Height, including handles, is 4-1/4″ from tabletop to top of handles. Perfect for buffet, or for hot appetizers. Suitable for Gas, Electric or Induction Cooking. Our Primo! 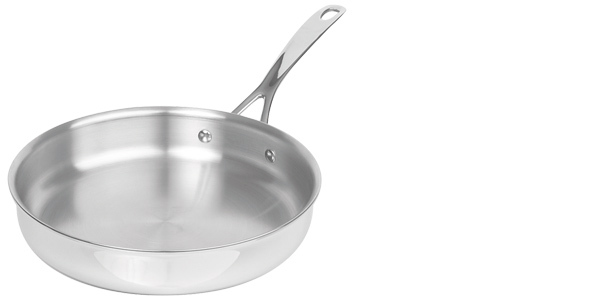 Sauteuse pans are 5-ply, bonded, stainless steel, with rolled and sealed rims for better wear and longevity. The polished interior means less food adhesion during cooking. Our handles are a cast stainless, stay-cool handle. Pans are durable and clean easily. 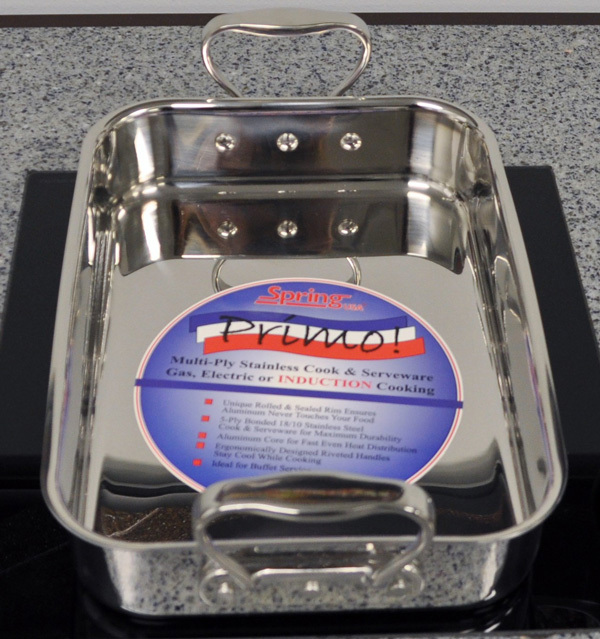 Pan body is thicker, with a thicker aluminum core – for fast, consistent heat transfer across the bottom and up the sides of the pan. 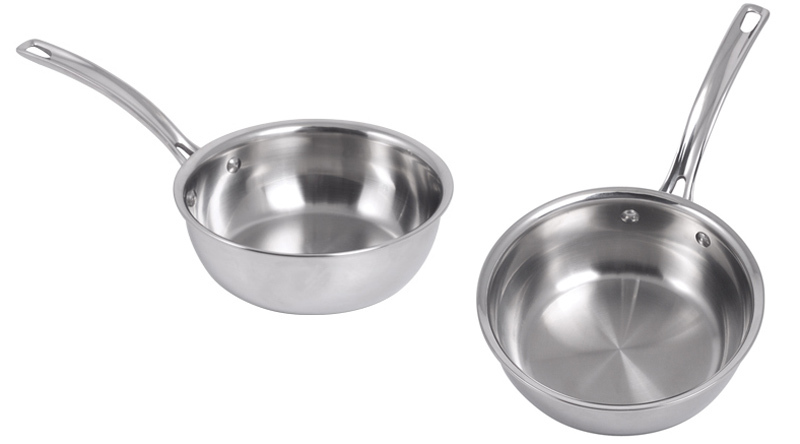 Pans feature a turned rim, allowing for ease of pouring. Contoured sides allow for easy stirring with whisks or spoons. Allows You to Present Smaller Portions of Food at a Time ~ This Means Fresher Servings to Your Guests! 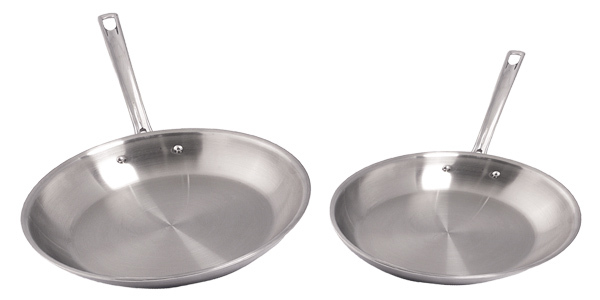 Multi-Ply Saute Pan with a 2-1/4 Quart Capacity. Features heat conductive, multi-layer construction that distributes heat quickly & evenly from pan bottom to upper rim. Outstanding performance on all types of heating sources, including induction, gas & electric. Showcases our unique Spring USA Edge ~ The multi-ply rim is sealed with stainless steel to protect the aluminum core. An extremely versatile piece! 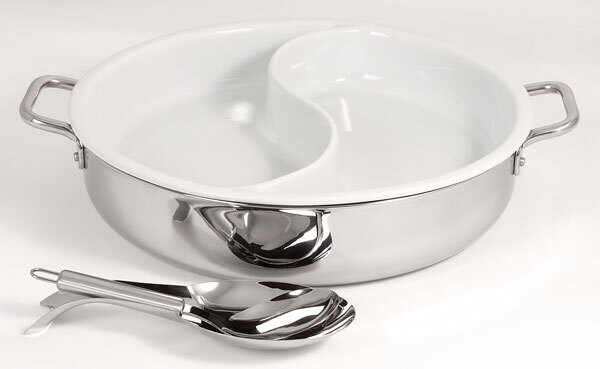 Use as is, with the cover OR order a porcelain divided insert ~ giving you the ability to serve two separate dishes from the same serving vessel! 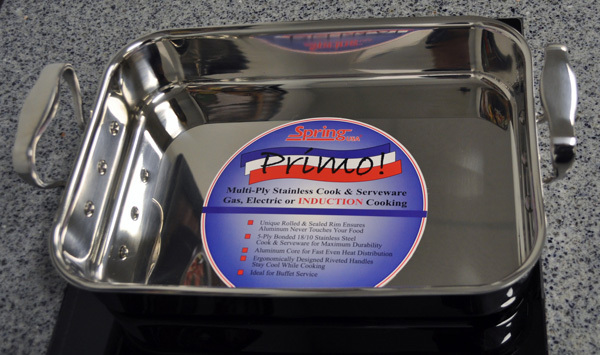 Perfect for use on gas, electric, ceramic or induction cookers. Terrific for display cooking as well! 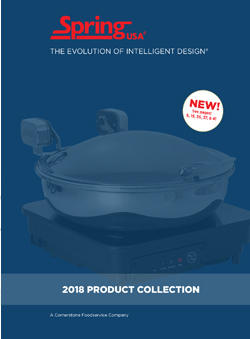 Spring USA recently unveiled their new line of Display Cookware ~ Primo! Cook & Serveware. Pans feature the Spring USA trademark 5-ply, bonded material with rolled & sealed rim. Aluminum core allows for fast, even heat distribution from pan bottom to upper rim. Pan measurements reflect dimensions from inside rim to inside rim of the pan. 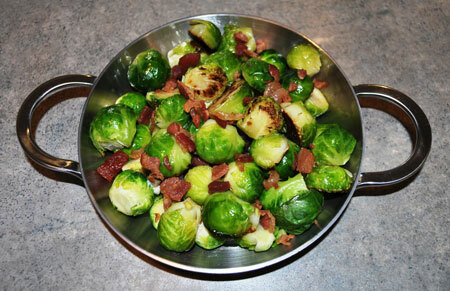 Sure to be the best addition to your cookware collection ~ Try all the pieces within the line! Give your guests that “Straight from the Kitchen” appeal! When it comes to cookware, no one wants to order ‘the standard’. What makes Primo! Cookware so different from the competition? 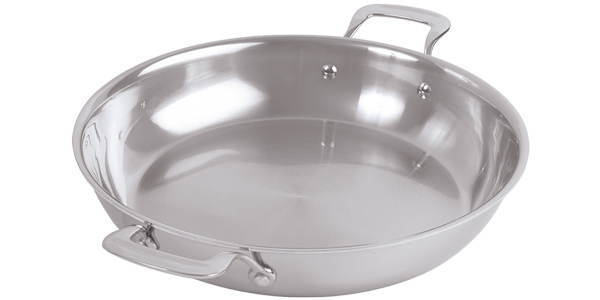 Spring USA cookware features their 5-ply, bonded pan body ~ not 3-ply like others in the marketplace. Spring USA cookware has a rolled & sealed rim ~ not like other cookware in the market. Why offer a completely sealed rim? If cookware has an unsealed rim, over time, detergents & microbes begin to break apart the layers of your cookware. The end result? You’re buying all new pans! And in today’s tough economy, who wants to have to purchase new cookware? Put your money into product that will last you a lifetime! For (optional) covers, see our 444 Series covers. This pan offers two short handles. These pans feature the Spring USA trademark 5-ply, bonded body with rolled & sealed rims. 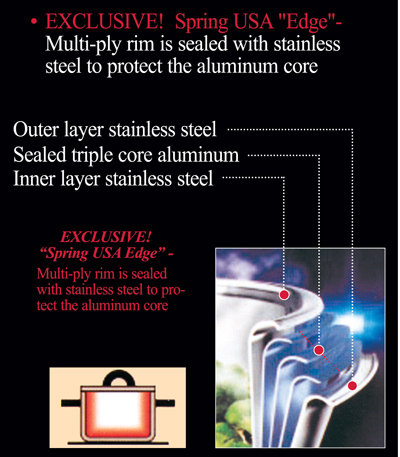 Aluminum core allows for fast, even heat distribution from pan bottom to upper rim. Less Waste! You’re Putting Out Smaller Portions at a Time. Pan Can Also Be Used for Tray Service in Banqueting ~ Attendees walk around serving orders with the Buffet Sauté! Perfect for buffets, or for one-dish serving. Pan can go straight from the kitchen to tabletop or buffet. Sloped sides allow for easy clean up. Pan features riveted, stay cool handles. The perfect addition to tableside service. The new, Mini-Gratin pan is perfect for small tastings, appetizers, sides (such as mushrooms or onions) or for individual portions. Use on a buffet in combination with our Warming Tray & Heat Lamp, and Guests can come up and take their own pre-sized portion. 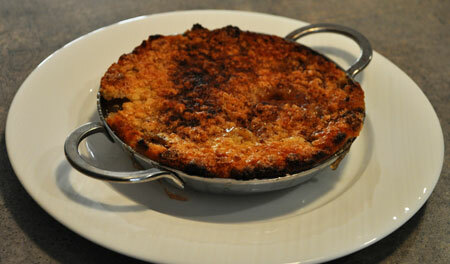 Mini-Gratin is perfect for desserts, as well. Think hot brownies, with melted hot fudge & ice cream ~ Perfect for hot cookies, cobblers or baked apples. Easy to prep and prepare, these mini gratin pans look so inviting! Newly designed, multi-ply layered construction for fast, even heat distribution along the bottom and up the sides. 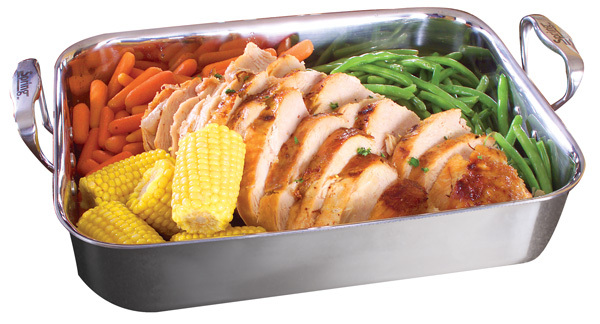 Impeccable finish, with rolled and sealed edges and riveted handles ~ perfect for large portion serving. 8460-60/40A 15-1/4″ 3-1/2″ 10 qt. Going for a different look for your buffet? Spring USA offers oven-able, white porcelain, divided inserts that can be used in conjunction with the paella pan. Another option for this pan? One of our Chicago Customers came up with this look… Use the Paella Pan as a water bath, and place a 510-60/40, full size, stainless steel insert inside ~ It’s referred to as the ‘Chaferless Chafer’.